Heat shock proteins (HSPs) have been reported to stimulate the immune system via innate receptors. However, the role of HSPs as endogenous adjuvants has been challenged by reports claiming that pure HSPs are not innate ligands; it is only the bacterial molecules trapped by the HSPs that can signal the innate immune system. In this review, we discuss data suggesting that both views, in essence, are correct; pure HSPs are indeed innate immunostimulators, but HSPs can also function as transducers of pathogen signals. 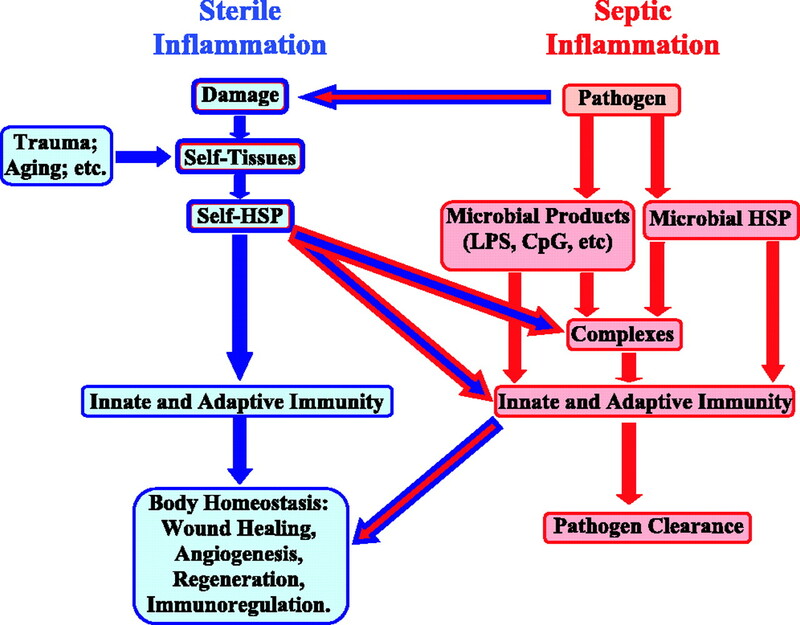 In other words, HSPs perform diverse functions in two alternative modes of inflammation: sterile inflammation, which results from endogenous stimuli and is necessary for body maintenance, and septic inflammation, which protects us from environmental pathogens. Endogenous HSPs are key players in the modulation of these two modes of inflammation, and as such, they are potential targets for new and more efficient therapies for cancer, infections, and autoimmunity. Heat shock proteins (HSPs)3 were originally identified as a group of proteins inducible by heat shock, but it was soon discovered that HSPs could also be induced by other stimuli such as growth factors, inflammation, and infection (1). HSPs span a broad distribution of molecular masses (10–170 kDa) and intracellular locations and are involved in an ever-growing list of physiological processes (2). Nevertheless, a unifying theme of HSPs is their chaperone activity, which contributes to cell survival under stress by facilitating the proper folding of denatured proteins (2). The high homology existing between human and microbial HSPs initially suggested that they could trigger autoimmune disorders through immune cross-reactivity. Indeed, HSP-specific immune responses have been implicated in the pathogenesis of type 1 diabetes mellitus (T1DM) (3, 4, 5), arthritis (6, 7, 8, 9), Behçet’s disease (10), and systemic lupus erythematosus (11). However, HSPs can also inhibit autoimmune diseases such as arthritis (12, 13, 14, 15, 16, 17) and T1DM (18, 19); these regulatory activities of HSP60 are beginning to be exploited for the treatment of human T1DM. The p277 peptide from human HSP60 (aa 437–460) has been reported to halt β cell destruction in newly diagnosed T1DM patients, leading to lower requirements for exogenous insulin (20). The role of HSPs in immunity got a new twist when HSPs were found to activate the immune system through nonclonal receptors such as TLRs. Srivastava and colleagues (21, 22) demonstrated that HSPs are endogenous adjuvants that could be used to induce strong tumor- or pathogen-specific immunity. These experiments paved the way to the discovery of the effects that HSPs have on macrophages (23, 24), dendritic cells (DCs) (23, 24), T cells (25, 26, 27, 28), B cells (29, 30), and NK cells via different receptors; some of these effects and the receptors involved are listed in Table I⇓. However, the immunostimulatory activity of HSPs has been challenged recently by reports that assign the stimulus to bacterial contaminants in the HSP preparations and not to the HSPs themselves (31, 32, 33). These reports are compatible with the teaching that TLRs only recognize foreign molecules, contributing to discrimination between self and non-self (34). Therefore, we are left to wonder whether HSPs have any innate immune effects not due to bacterial contaminants. Moreover, does the copurification of HSPs with bacterial contaminants add anything to our knowledge of the roles of HSPs in vivo? Do pure HSPs have any effect on innate immunity? Mammalian HSP60 and HSP70 were described to activate macrophages and DCs via TLR4 and/or TLR2 (35, 36, 37). Because TLR4 and TLR2 also mediate the activation of macrophages and DCs by bacterial LPS (38, 39, 40), it was conceivable that the cytokine activities of HSPs were caused by bacterial contaminants copurified with the recombinant HSP60 or HSP70 used in those experiments. LPS contamination is usually ruled out by treatment with polymixin B, which binds LPS inhibiting its immunostimulatory activity. In addition, HSP preparations are boiled to disrupt their conformation and so destroy their immunostimulatory activity, leaving any contaminating LPS untouched. Nevertheless, Gao and Tsan (31, 32, 33) recently reported that LPS and other bacterial contaminants evade detection by the standard tests of polymixin B and boiling and were responsible for the activation of macrophages by HSP70 and HSP60. Therefore, these authors called for caution in interpreting the apparent immunostimulatory activities of HSPs. Although the Gao and Tsan experiments demonstrated contamination of their recombinant HSP60 and HSP70, several independent lines of evidence suggest that HSPs, nevertheless, do manifest innate immune activities that are not due to bacterial contaminants. Mammalian HSP70 and gp96 purified from murine livers and kidneys were shown to activate macrophages and DCs (41). Based on the mammalian origin of these HSP preparations and their purification by a pyrogen-free method, the effects of HSP70 and gp96 on macrophages and DCs cannot be easily assigned to bacterial contaminants. We have used human HSP60 and HSP70 produced in an eukaryotic cell-free system, and therefore free of bacterial contaminants, to demonstrate that pure HSP60 or HSP70 can activate primary macrophages and the macrophage-like cell line RAW (Nussbaum et al., manuscript in preparation). Moreover, mammalian cells induced to display HSP70 on their surface can activate macrophages by way of TLR2 and TLR4 signaling (42). The effects of pure HSPs have also been studied on non-APC cell types. Highly purified HSP60 can stimulate T cells (25, 26, 27, 43). Moreover, synthetic peptides of human HSP70 (44) can activate NK cells, and a peptide of human HSP60 (25) as well as whole HSP60 can modify T cell behavior via TLR2 (25, 26, 27). All in all, these results indicate that mammalian HSPs can activate innate immunity in the absence of bacterial contaminants. Although some of these effects seem to be mediated by TLRs, their participation in each one of the observed effects should be carefully analyzed. Whether microbial HSPs are also endowed with immuno-stimulatory activities is still open to speculation; however, the high degree of sequence conservation in HSPs throughout evolution suggests that HSPs from different organisms may share immuno-stimulatory properties. Gao and Tsan’s experiments, in summary, do not invalidate the conclusion that mammalian HSPs may themselves function as endogenous adjuvants, but they rightly call our attention to the physiological role played by complexes of HSPs with other molecules, self and non-self. The nature of these complexes and their possible physiological significance should be considered. HSPs can bind a broad array of peptides (23), including those that result from cell metabolism. Although the lifespan of such peptides within the cell is very short (45, 46), a fraction of them are likely to interact with endogenous HSPs, forming HSP-peptide complexes that reflect the intracellular environment and the state of the cell in which they were formed. These HSP-peptide complexes contribute to the fine-tuning of specific immune responses but can also play a role in immune-mediated disorders. HSP-peptide complexes derived from cancer cells include tumor-associated Ags. Based on the immunostimulatory adjuvant properties of HSPs, these HSP-peptide complexes are likely to activate tumor-specific immunity and could therefore contribute to the immunosurveillance of tumors. Moreover, HSP-peptide complexes purified from tumors can also be used in cancer immunotherapy as a tool to induce strong antitumor immune responses in mice (47) and humans (48). The same mechanism that facilitates the induction of effective antitumor immunity also might favor the development, under different circumstances, of pathologic autoimmunity. Brain samples taken from multiple sclerosis (MS) patients or from a rodent model of MS contain complexes of HSP70 with myelin basic protein or proteolipid protein (49), Ags that are well-known targets in MS (50). These HSP-peptide complexes facilitate peptide up-take and presentation, increasing the activation of the Ag-specific T cells that drive the disease (49, 51). Similar observations have been made in the synovial fluid of rheumatoid arthritis patients, where HSP70 complexed with self-proteins might contribute to Ag spreading and the perpetuation of the inflammatory process in the joint (52). Surprisingly, HSP-peptide complexes can also shut down Ag-specific immunity (53). Although the mechanisms involved in this Ag-specific immunomodulation are not completely understood, HSP-peptide complexes have already been used with success to down-regulate CNS and β cell-specific, T cell-mediated autoimmunity (50, 54). In summary, HSP-peptide complexes are sources of information that can influence the immune response, manifesting both pro- and anti-inflammatory activities. They can contribute to the perpetuation of certain autoimmune disorders, but they might also provide new tools for the immunotherapy of cancer and pathologic autoimmunity. In the event of an infection, the ability of HSPs to interact with a broad array of peptides allows them to bind microbial peptides and enhance their immunogenicity (21, 55, 56). However, endogenous HSPs can also interact with microbial molecules other than peptides to facilitate their detection by the immune system; this is exemplified by the interaction of bacterial DNA and LPS with HSPs. Bacterial DNA harbors unmethylated CpG motifs that stimulate innate immunity via TLR9 (57). HSP90 binds unmethylated CpG-motifs and might directly interact with TLR9 (58). Moreover, intracellular HSP90 seems to be involved in the signal transduction triggered by CpG motifs, which can be blocked with the HSP90-specific inhibitor geldanamycin (59). In this way, HSP90 can play two roles in the immune detection of bacterial DNA: it facilitates the interaction of CpG-containing DNA with TLR9, while it also mediates the resulting intracellular signaling. HSPs are also involved in the amplification of the immune response to LPS. Triantafilou et al. (60) have shown recently that the LPS receptor complex includes HSP70 and HSP90 in addition to the MD2 and TLR4 molecules. Indeed, HSP70, HSP90, and gp96 can bind LPS directly (60, 61, 62). Upon binding LPS, HSP70 and HSP90 are targeted to the Golgi apparatus together with TLR4, suggesting that HSP70 and HSP90 are not only involved in the transfer of LPS to the TLR4-MD2 complex but are also involved in LPS-triggered signal transduction (63). Indeed, a blocker of HSP90 activity could inhibit the activation of NF-κB triggered by LPS (59). Thus, during the course of an infection, self-HSPs interact with microbial molecules such as peptides, DNA, or LPS to facilitate their immune detection. Moreover, some HSPs are directly involved in signal-transduction pathways triggered by microbial molecules. These observations underscore the importance of the experiments that called attention to the bacterial contaminants in recombinant HSP preparations (31, 32, 33); these contaminants might simply reflect the ability of HSPs to interact with different microbial molecules and augment their immunostimulatory activities in vivo. This seems to be the case for HSP70/LPS complexes, which are more immunostimulatory than their isolated components (64). Based on the functions performed by HSPs, alone and in complex with other molecules, we can briefly consider some of the physiological roles of HSPs in the regulation of the immune response and inflammation generally (Fig. 1⇓). Control of T cell reactivity. Endogenous HSPs help to keep autoimmunity under control through direct and indirect mechanisms. Human HSP60 can directly inhibit chemotaxis and activate anti-inflammatory activities in human T cells, via TLR2 and suppressor of cytokine signaling 3 (25, 27). Remarkably, naive T cells are more sensitive to the effects of HSP60 than memory T cells, suggesting that this form of regulation might be of importance during the induction of primary immune responses. HSP60 signaling via innate receptors can also influence T cell cytokine polarization. Human T cells activated by mitogen in the presence of HSP60 show a decreased secretion of IFN-γ and an increased secretion of IL-10, associated with down-regulation of T-bet, NFATp, and NF-κB, and a concomitant up-regulation of GATA-3 (26). In other words, soluble HSP60, acting via TLRs, can inhibit the proinflammatory activities of T cells. HSPs can also regulate autoimmunity, indirectly, by activating regulatory T cells that control pathogenic T cells specific for self-Ags other than HSPs. These HSP-specific regulatory T cells can be activated and expanded by several regimes of vaccination. We have used DNA constructs coding for human HSP60, HSP70, or HSP90 to boost regulatory T cell responses capable of halting the progression of autoimmune diabetes (19) or arthritis (12, 13, 14). Other investigators have used purified mammalian gp96 to activate regulatory T cells that inhibit CNS or β cell-specific autoimmunity (54). The immunomodulatory mechanisms used by these HSP-specific regulatory T cells are diverse; however, one mechanism of particular interest might be the recognition by anti-ergotypic T regulators of up-regulated HSPs on activated pathogenic T cells; such anti-ergotypic T regulators have been reviewed recently (65). Heart surgery and stroke have been shown to trigger the release of HSPs to the circulation (66, 67). Moreover, disorders associated with pathogenic inflammation, such as T1DM (3) and atherosclerosis (68), show a positive correlation with increased levels of serum HSPs. It is likely that different signaling pathways might lead to the secretion of HSPs in different contexts (42, 69); but the origin of the circulating HSPs associated with inflammation might be necrotic tissue. Basu et al. (36) demonstrated that necrotic but not apoptotic cell death triggers the release of HSP70, gp96, and HSP90. The secreted HSPs were purified and shown to activate macrophages and DCs via the NF-κB pathway (36). When the effect of LPS was studied on the same cells, the kinetics of NF-κB activation triggered by LPS were shown to be faster than those following stimulation by HSP, pointing out uncharacterized differences in the signaling pathways involved. Purified HSPs have been shown to activate APCs in vitro, but what is the role of HSPs in immunity and autoimmunity in vivo? To study the relationship between APC activation by self-HSPs and autoimmunity, Liu et al. (70) generated transgenic mice expressing gp96 on the surface of several cell types. The expression of the transgene did not alter B cell or T cell development. However, the transgene triggered a lupus-like syndrome characterized by proliferative nephritis, hypergammaglobulemia, and Abs to the nucleus and to ds- and ssDNA. This autoimmune disorder seems to be triggered by the hyperstimulation of DCs by membrane-bound gp96, which finally results in the activation of self-reactive T and B cells. Interestingly, the hyperstimulation of DCs and the systemic lupus erythematosus-like syndrome was mediated by the adaptor molecule MyD88, involved in several TLR signal transduction pathways (71). Millar et al. (72) used a different approach to study the effect of DC activation by endogenous HSPs in autoimmunity. They used double-transgenic mice that express the lymphocytic choriomeningitis virus glycoprotein (GP) in pancreatic β cells, along with transgenic GP-specific TCRs in the majority of their mature CD8+ T cells. In these mice, the administration of the GP epitope (gp33) recognized by the transgenic TCR or HSP70 alone did not trigger disease. However, overt diabetes was induced when HSP70 and gp33 were administered simultaneously (72). Notably, a physical interaction between gp33 and HSP70 was not needed to trigger the diabetes. The authors suggested that the induction of overt diabetes was due to a combination of Ag-specific activation triggered by gp33 with the adjuvant effects of HSP70. In summary, similar to what we have described for HSP-autoantigen complexes, endogenous HSPs can either up-regulate or down-regulate autoimmune diseases depending, among other factors, on the type of immune cell targeted and the mix of HSP and other self- and foreign molecules at the site. Augmentation of the adaptive immune response. CpG motifs present in bacterial DNA have been shown to trigger the release of HSP70 from macrophages (73). Some of the secreted HSP70 molecules were found to be loaded with peptides; these HSP70-peptide complexes were taken up by DCs and could activate peptide-specific T cells. Infection, LPS, and cytokines are also known to up-regulate HSP levels (74, 75). Thus, the up-regulation and secretion of self-HSPs triggered by infection, together with the adjuvant function of microbial HSPs and their role as immunodominant Ags, might facilitate the induction of an efficient immune response against invading pathogens. Regulation of the innate immune response. The up-regulation of HSPs and their release to the circulation as a consequence of infection adds another level of complexity to the host/pathogen interaction. HSP60, HSP70, and bacterial LPS signal cells via TLR2/TLR4 mechanisms (76). The signaling pathways triggered by different TLRs are known to interfere with each other (77, 78, 79, 80, 81, 82). Thus, the cross-talk between different signaling pathways activated by self- and/or foreign immunostimulators might represent a regulatory mechanism that fine tunes and controls potentially harmful immune responses. Indeed, repetitive activation of macrophages with self-HSP60 renders them nonresponsive to LPS, and LPS stimulation can abrogate the subsequent response to HSP60 (83, 84). This observation also suggests that, by triggering different TLRs, the environment can alter homeostatic responses mediated by endogenous adjuvants such as HSPs. These interactions might constitute the molecular basis for the hygiene hypothesis, which links exposure to environmental microbes to a lower prevalence of immune-mediated disorders (85). Nevertheless, HSPs might also participate in positive feedback loops that perpetuate inflammation. Infection triggers HSP up-regulation and release. However, these newly released HSPs can bind microbial products and increase their proinflammatory activities, leading to the release of more proinflammatory factors, that prompt the induction and release of more HSPs. Positive feedback loops can lead to chaos. The study of the interactions of HSPs with microbial molecules and the modulation of their inflammatory activities should open new horizons in our understanding of the complex mechanisms that connect autoimmune disorders with environmental stimuli. How can we connect the different roles played by HSPs in physiology (Table II⇓)? We might begin by considering the concept of inflammation. Inflammation is “a process which begins following a sublethal injury and ends with complete healing” (86). From this point of view, inflammation that is needed for healing is essential for body maintenance (87). Indeed, inflammation is involved in processes as diverse as angiogenesis, wound healing, tissue remodeling and regeneration, connective tissue formation (88), and the recovery of function following trauma to the CNS (89). However, in addition to maintenance, inflammation must also keep foreign pathogens under tight control. Inflammation, then, performs two types of services: maintenance and defense. In this light, one might well differentiate between sterile and septic inflammation. Sterile inflammation is involved in body homeostasis and so results from endogenous stimuli. Septic inflammation arises to fight the infectious agents that trigger it. Self-HSPs play a role in both types of inflammation, boosting and controlling the immune response. In septic inflammation, microbial molecules can complex with self- or foreign HSPs to facilitate the induction of an effective immune response. Conversely, microbial products can potentially interfere with the mechanisms of sterile inflammation needed for body homeostasis, triggering the development of inflammatory disease. Given the danger that an uncontrolled inflammatory response might represent for the individual, several regulatory mechanisms have been selected through evolution. The immune system has to determine the exact location, kinetics, and intensity of the inflammatory response needed to perform each biological process. By being involved in both forms of inflammation, HSPs are key elements in fine-tuning the inflammatory response (87). The central position of HSPs in immunoregulation and in the healthy immune repertoire (90) could be used strategically in our quest to develop better therapies for cancer, infections, and autoimmune disorders. Nature has learned to use HSPs; so might we. ↵1 This work is supported in part by grants from the Center for the Study of Emerging Diseases and by the European Union. ↵3 Abbreviations used in this paper: HSP, heat shock protein; T1DM, type 1 diabetes mellitus; Ms, multiple sclerosis; GP, glycoprotein. Ritossa, F.. 1996. Discovery of the heat shock response. Cell Stress Chaperones 1:97.-98. Hartl, F. U., M. Hayer-Hartl. 2002. Molecular chaperones in the cytosol: from nascent chain to folded protein. Science 295:1852.-1858. Elias, D., D. Markovits, T. Reshef, R. van der Zee, I. R. Cohen. 1990. Induction and therapy of autoimmune diabetes in the non-obese diabetic (NOD/Lt) mouse by a 65-kDa heat shock protein. Proc. Natl. Acad. Sci. USA 87:1576.-1580. Abulafia-Lapid, R., D. Elias, I. Raz, Y. Keren-Zur, H. Atlan, I. R. Cohen. 1999. T cell proliferative responses of type 1 diabetes patients and healthy individuals to human hsp60 and its peptides. J. Autoimmun. 12:121.-129. Abulafia-Lapid, R., D. Gillis, O. Yosef, H. Atlan, I. R. Cohen. 2003. T cells and autoantibodies to human HSP70 in type 1 diabetes in children. J. Autoimmun. 20:313.-321. Gaston, J. S., P. F. Life, L. C. Bailey, P. A. Bacon. 1989. In vitro responses to a 65-kilodalton mycobacterial protein by synovial T cells from inflammatory arthritis patients. J. Immunol. 143:2494.-2500.
van Eden, W., J. E. Thole, R. van der Zee, A. Noordzij, J. D. van Embden, E. J. Hensen, I. R. Cohen. 1988. Cloning of the mycobacterial epitope recognized by T lymphocytes in adjuvant arthritis. Nature 331:171.-173. Blass, S., A. Union, J. Raymackers, F. Schumann, U. Ungethum, S. Muller-Steinbach, F. De Keyser, J. M. Engel, G. R. Burmester. 2001. The stress protein BiP is overexpressed and is a major B and T cell target in rheumatoid arthritis. Arthritis Rheum. 44:761.-771. Corrigall, V. M., M. D. Bodman-Smith, M. S. Fife, B. Canas, L. K. Myers, P. Wooley, C. Soh, N. A. Staines, D. J. Pappin, S. E. Berlo, et al 2001. The human endoplasmic reticulum molecular chaperone BiP is an autoantigen for rheumatoid arthritis and prevents the induction of experimental arthritis. J. Immunol. 166:1492.-1498. Lehner, T.. 1997. The role of heat shock protein, microbial and autoimmune agents in the aetiology of Behcet’s disease. Int. Rev. Immunol. 14:21.-32. Dhillon, V., D. Latchman, D. Isenberg. 1991. Heat shock proteins and systemic lupus erythematosus. Lupus 1:3.-8. Quintana, F. J., P. Carmi, F. Mor, I. R. Cohen. 2002. Inhibition of adjuvant arthritis by a DNA vaccine encoding human heat shock protein 60. J. Immunol. 169:3422.-3428. Quintana, F. J., P. Carmi, F. Mor, I. R. Cohen. 2003. DNA fragments of human HSP60 vaccinate against adjuvant arthritis: identification of a regulatory HSP60 peptide. J. Immunol. 171:3533.-3541. Quintana, F. J., P. Carmi, F. Mor, I. R. Cohen. 2004. Inhibition of adjuvant-induced arthritis by DNA vaccination with the 70-kd or the 90-kd human heat-shock protein: immune cross-regulation with the 60-kd heat-shock protein. Arthritis Rheum. 50:3712.-3720. Prakken, A. B., W. van Eden, G. T. Rijkers, W. Kuis, E. A. Toebes, E. R. de Graeff-Meeder, R. van der Zee, B. J. Zegers. 1996. Autoreactivity to human heat-shock protein 60 predicts disease remission in oligoarticular juvenile rheumatoid arthritis. Arthritis Rheum. 39:1826.-1832. Tanaka, S., Y. Kimura, A. Mitani, G. Yamamoto, H. Nishimura, R. Spallek, M. Singh, T. Noguchi, Y. Yoshikai. 1999. Activation of T cells recognizing an epitope of heat-shock protein 70 can protect against rat adjuvant arthritis. J. Immunol. 163:5560.-5565. Ulmansky, R., C. J. Cohen, F. Szafer, E. Moallem, Z. G. Fridlender, Y. Kashi, Y. Naparstek. 2002. Resistance to adjuvant arthritis is due to protective antibodies against heat shock protein surface epitopes and the induction of IL-10 secretion. J. Immunol. 168:6463.-6469. Elias, D., T. Reshef, O. S. Birk, R. van der Zee, M. D. Walker, I. R. Cohen. 1991. Vaccination against autoimmune mouse diabetes with a T cell epitope of the human 65-kDa heat shock protein. Proc. Natl. Acad. Sci. USA 88:3088.-3091. Quintana, F. J., P. Carmi, I. R. Cohen. 2002. DNA vaccination with heat shock protein 60 inhibits cyclophosphamide-accelerated diabetes. J. Immunol. 169:6030.-6035. Raz, I., D. Elias, A. Avron, M. Tamir, M. Metzger, I. R. Cohen. 2001. β Cell function in new-onset type 1 diabetes and immunomodulation with a heat-shock protein peptide (DiaPep277): a randomised, double-blind, phase II trial. Lancet 358:1749.-1753. Anthony, L. S., H. Wu, H. Sweet, C. Turnnir, L. J. Boux, L. A. Mizzen. 1999. Priming of CD8+ CTL effector cells in mice by immunization with a stress protein-influenza virus nucleoprotein fusion molecule. Vaccine 17:373.-383. Blachere, N. E., Z. Li, R. Y. Chandawarkar, R. Suto, N. S. Jaikaria, S. Basu, H. Udono, P. K. Srivastava. 1997. Heat shock protein-peptide complexes, reconstituted in vitro, elicit peptide-specific cytotoxic T lymphocyte response and tumor immunity. J. Exp. Med. 186:1315.-1322. Srivastava, P.. 2002. Roles of heat-shock proteins in innate and adaptive immunity. Nat. Rev. Immunol. 2:185.-194. Beg, A. A.. 2002. Endogenous ligands of Toll-like receptors: implications for regulating inflammatory and immune responses. Trends Immunol. 23:509.-512. Zanin-Zhorov, A., G. Tal, S. Shivtiel, M. Cohen, T. Lapidot, G. Nussbaum, R. Margalit, I. R. Cohen, O. Lider. 2005. Heat shock protein 60 activates cytokine-associated negative regulator SOCS3 in T cells: effects on signaling, chemotaxis, and inflammation. J. Immunol. 175:276.-285. Zanin-Zhorov, A., R. Bruck, G. Tal, S. Oren, H. Aeed, R. Hershkoviz, I. R. Cohen, O. Lider. 2005. Heat shock protein 60 inhibits Th1-mediated hepatitis model via innate regulation of Th1/Th2 transcription factors and cytokines. J. Immunol. 174:3227.-3236. Zanin-Zhorov, A., G. Nussbaum, S. Franitza, I. R. Cohen, O. Lider. 2003. T cells respond to heat shock protein 60 via TLR2: activation of adhesion and inhibition of chemokine receptors. FASEB J. 17:1567.-1569. Wallin, R. P., A. Lundqvist, S. H. More, A. von Bonin, R. Kiessling, H. G. Ljunggren. 2002. Heat-shock proteins as activators of the innate immune system. Trends Immunol. 23:130.-135. Rico, A. I., S. O. Angel, C. Alonso, J. M. Requena. 1999. Immunostimulatory properties of the Leishmania infantum heat shock proteins HSP70 and HSP83. Mol. Immunol. 36:1131.-1139. Rico, A. I., N. Girones, M. Fresno, C. Alonso, J. M. Requena. 2002. The heat shock proteins, Hsp70 and Hsp83, of Leishmania infantum are mitogens for mouse B cells. Cell Stress Chaperones 7:339.-346. Gao, B., M. F. Tsan. 2003. Recombinant human heat shock protein 60 does not induce the release of tumor necrosis factor α from murine macrophages. J. Biol. Chem. 278:22523.-22529. Gao, B., M. F. Tsan. 2003. Endotoxin contamination in recombinant human heat shock protein 70 (Hsp70) preparation is responsible for the induction of tumor necrosis factor α release by murine macrophages. J. Biol. Chem. 278:174.-179. Gao, B., M. F. Tsan. 2004. Induction of cytokines by heat shock proteins and endotoxin in murine macrophages. Biochem. Biophys. Res. Commun. 317:1149.-1154. Medzhitov, R., C. A. Janeway, Jr. 2002. Decoding the patterns of self and nonself by the innate immune system. Science 296:298.-300. Chen, W., U. Syldath, K. Bellmann, V. Burkart, H. Kolb. 1999. Human 60-kDa heat-shock protein: a danger signal to the innate immune system. J. Immunol. 162:3212.-3219. Basu, S., R. J. Binder, R. Suto, K. M. Anderson, P. K. Srivastava. 2000. Necrotic but not apoptotic cell death releases heat shock proteins, which deliver a partial maturation signal to dendritic cells and activate the NF-κB pathway. Int. Immunol. 12:1539.-1546. Vabulas, R. M., P. Ahmad-Nejad, S. Ghose, C. J. Kirschning, R. D. Issels, H. Wagner. 2002. HSP70 as endogenous stimulus of the Toll/interleukin-1 receptor signal pathway. J. Biol. Chem. 277:15107.-15112. Darveau, R. P., T. T. Pham, K. Lemley, R. A. Reife, B. W. Bainbridge, S. R. Coats, W. N. Howald, S. S. Way, A. M. Hajjar. 2004. Porphyromonas gingivalis lipopolysaccharide contains multiple lipid A species that functionally interact with both Toll-like receptors 2 and 4. Infect. Immun. 72:5041.-5051. Hoshino, K., O. Takeuchi, T. Kawai, H. Sanjo, T. Ogawa, Y. Takeda, K. Takeda, S. Akira. 1999. Cutting edge: Toll-like receptor 4 (TLR4)-deficient mice are hyporesponsive to lipopolysaccharide: evidence for TLR4 as the Lps gene product. J. Immunol. 162:3749.-3752. Qureshi, S. T., L. Lariviere, G. Leveque, S. Clermont, K. J. Moore, P. Gros, D. Malo. 1999. Endotoxin-tolerant mice have mutations in Toll-like receptor 4 (Tlr4). J. Exp. Med. 189:615.-625. Panjwani, N. N., L. Popova, P. K. Srivastava. 2002. Heat shock proteins gp96 and hsp70 activate the release of nitric oxide by APCs. J. Immunol. 168:2997.-3003. Korbelik, M., J. Sun, I. Cecic. 2005. Photodynamic therapy-induced cell surface expression and release of heat shock proteins: relevance for tumor response. Cancer Res. 65:1018.-1026. Osterloh, A., F. Meier-Stiegen, A. Veit, B. Fleischer, A. Von Bonin, M. Breloer. 2004. LPS-free heat shock protein 60 activates T cells. J. Biol. Chem. 279:47906.-47911. Gastpar, R., C. Gross, L. Rossbacher, J. Ellwart, J. Riegger, G. Multhoff. 2004. The cell surface-localized heat shock protein 70 epitope TKD induces migration and cytolytic activity selectively in human NK cells. J. Immunol. 172:972.-980. Reits, E., J. Neijssen, C. Herberts, W. Benckhuijsen, L. Janssen, J. W. Drijfhout, J. Neefjes. 2004. A major role for TPPII in trimming proteasomal degradation products for MHC class I antigen presentation. Immunity 20:495.-506. Reits, E., A. Griekspoor, J. Neijssen, T. Groothuis, K. Jalink, P. van Veelen, H. Janssen, J. Calafat, J. W. Drijfhout, J. Neefjes. 2003. Peptide diffusion, protection, and degradation in nuclear and cytoplasmic compartments before antigen presentation by MHC class I. Immunity 18:97.-108. Basu, S., P. K. Srivastava. 1999. Calreticulin, a peptide-binding chaperone of the endoplasmic reticulum, elicits tumor- and peptide-specific immunity. J. Exp. Med. 189:797.-802. Rivoltini, L., C. Castelli, M. Carrabba, V. Mazzaferro, L. Pilla, V. Huber, J. Coppa, G. Gallino, C. Scheibenbogen, P. Squarcina, et al 2003. Human tumor-derived heat shock protein 96 mediates in vitro activation and in vivo expansion of melanoma- and colon carcinoma-specific T cells. J. Immunol. 171:3467.-3474. Cwiklinska, H., M. P. Mycko, O. Luvsannorov, B. Walkowiak, C. F. Brosnan, C. S. Raine, K. W. Selmaj. 2003. Heat shock protein 70 associations with myelin basic protein and proteolipid protein in multiple sclerosis brains. Int. Immunol. 15:241.-249. Galazka, G., A. Walczak, T. Berkowicz, K. Selmaj. 2001. Effect of Hsp70-peptide complexes generated in vivo on modulation EAE. Adv. Exp. Med. Biol. 495:227.-230. Mycko, M. P., H. Cwiklinska, J. Szymanski, B. Szymanska, G. Kudla, L. Kilianek, A. Odyniec, C. F. Brosnan, K. W. Selmaj. 2004. Inducible heat shock protein 70 promotes myelin autoantigen presentation by the HLA class II. J. Immunol. 172:202.-213. Martin, C. A., S. E. Carsons, R. Kowalewski, D. Bernstein, M. Valentino, F. Santiago-Schwarz. 2003. Aberrant extracellular and dendritic cell (DC) surface expression of heat shock protein (hsp)70 in the rheumatoid joint: possible mechanisms of hsp/DC-mediated cross-priming. J. Immunol. 171:5736.-5742. Chandawarkar, R. Y., M. S. Wagh, P. K. Srivastava. 1999. The dual nature of specific immunological activity of tumor-derived gp96 preparations. J. Exp. Med. 189:1437.-1442. Chandawarkar, R. Y., M. S. Wagh, J. T. Kovalchin, P. Srivastava. 2004. Immune modulation with high-dose heat-shock protein gp96: therapy of murine autoimmune diabetes and encephalomyelitis. Int. Immunol. 16:615.-624. SenGupta, D., P. J. Norris, T. J. Suscovich, M. Hassan-Zahraee, H. F. Moffett, A. Trocha, R. Draenert, P. J. Goulder, R. J. Binder, D. L. Levey, et al 2004. Heat shock protein-mediated cross-presentation of exogenous HIV antigen on HLA class I and class II. J. Immunol. 173:1987.-1993. Chu, N. R., H. B. Wu, T. Wu, L. J. Boux, M. I. Siegel, L. A. Mizzen. 2000. Immunotherapy of a human papillomavirus (HPV) type 16 E7-expressing tumour by administration of fusion protein comprising Mycobacterium bovis bacille Calmette-Guerin (BCG) hsp65 and HPV16 E7. Clin. Exp. Immunol. 121:216.-225. Bandholtz, L., Y. Guo, C. Palmberg, K. Mattsson, B. Ohlsson, A. High, J. Shabanowitz, D. F. Hunt, H. Jornvall, H. Wigzell, B. Agerberth, G. H. Gudmundsson. 2003. Hsp90 binds CpG oligonucleotides directly: implications for hsp90 as a missing link in CpG signaling and recognition. Cell. Mol. Life Sci. 60:422.-429. Zhu, F. G., D. S. Pisetsky. 2001. Role of the heat shock protein 90 in immune response stimulation by bacterial DNA and synthetic oligonucleotides. Infect. Immun. 69:5546.-5552. Triantafilou, K., M. Triantafilou, R. L. Dedrick. 2001. A CD14-independent LPS receptor cluster. Nat. Immunol. 2:338.-345. Reed, R. C., B. Berwin, J. P. Baker, C. V. Nicchitta. 2003. GRP94/gp96 elicits ERK activation in murine macrophages: a role for endotoxin contamination in NF-κB activation and nitric oxide production. J. Biol. Chem. 278:31853.-31860. Byrd, C. A., W. Bornmann, H. Erdjument-Bromage, P. Tempst, N. Pavletich, N. Rosen, C. F. Nathan, A. Ding. 1999. Heat shock protein 90 mediates macrophage activation by Taxol and bacterial lipopolysaccharide. Proc. Natl. Acad. Sci. USA 96:5645.-5650. Triantafilou, M., K. Triantafilou. 2004. Heat-shock protein 70 and heat-shock protein 90 associate with Toll-like receptor 4 in response to bacterial lipopolysaccharide. Biochem. Soc. Trans. 32:636.-639. Campisi, J., T. H. Leem, M. Fleshner. 2003. Stress-induced extracellular Hsp72 is a functionally significant danger signal to the immune system. Cell Stress Chaperones 8:272.-286. Cohen, I. R., F. J. Quintana, A. Mimran. 2004. Tregs in T cell vaccination: exploring the regulation of regulation. J. Clin. Invest. 114:1227.-1232. Dybdahl, B., A. Wahba, E. Lien, T. H. Flo, A. Waage, N. Qureshi, O. F. Sellevold, T. Espevik, A. Sundan. 2002. Inflammatory response after open heart surgery: release of heat-shock protein 70 and signaling through Toll-like receptor-4. Circulation 105:685.-690. Schett, G., B. Metzler, R. Kleindienst, A. Amberger, H. Recheis, Q. Xu, G. Wick. 1999. Myocardial injury leads to a release of heat shock protein (hsp) 60 and a suppression of the anti-hsp65 immune response. Cardiovasc. Res. 42:685.-695. Xu, Q., G. Schett, H. Perschinka, M. Mayr, G. Egger, F. Oberhollenzer, J. Willeit, S. Kiechl, G. Wick. 2000. Serum soluble heat shock protein 60 is elevated in subjects with atherosclerosis in a general population. Circulation 102:14.-20. Lancaster, G. I., M. A. Febbraio. 2005. Exosome-dependent trafficking of HSP70: A novel secretory pathway for cellular stress proteins. J. Biol. Chem. 280:23349.-23355. Liu, B., J. Dai, H. Zheng, D. Stoilova, S. Sun, Z. Li. . 2003. Cell surface expression of an endoplasmic reticulum resident heat shock protein gp96 triggers MyD88-dependent systemic autoimmune diseases. Proc. Natl. Acad. Sci. USA 100:15824.-15829. Akira, S., K. Takeda. 2004. Toll-like receptor signalling. Nat. Rev. Immunol. 4:499.-511. Millar, D. G., K. M. Garza, B. Odermatt, A. R. Elford, N. Ono, Z. Li, P. S. Ohashi. 2003. Hsp70 promotes antigen-presenting cell function and converts T cell tolerance to autoimmunity in vivo. Nat. Med. 9:1469.-1476. Kumaraguru, U., C. D. Pack, B. T. Rouse. 2003. Toll-like receptor ligand links innate and adaptive immune responses by the production of heat-shock proteins. J. Leukocyte Biol. 73:574.-583. Saito, K., H. Katsuragi, M. Mikami, C. Kato, M. Miyamaru, K. Nagaso. 1997. Increase of heat-shock protein and induction of γ/δ T cells in peritoneal exudate of mice after injection of live Fusobacterium nucleatum. Immunology 90:229.-235. Teshima, S., K. Rokutan, M. Takahashi, T. Nikawa, K. Kishi. 1996. Induction of heat shock proteins and their possible roles in macrophages during activation by macrophage colony-stimulating factor. Biochem. J. 315:(Pt 2):497.-504. Vabulas, R. M., P. Ahmad-Nejad, C. da Costa, T. Miethke, C. J. Kirschning, H. Hacker, H. Wagner. 2001. Endocytosed HSP60s use Toll-like receptor 2 (TLR2) and TLR4 to activate the Toll/interleukin-1 receptor signaling pathway in innate immune cells. J. Biol. Chem. 276:31332.-31339. Lehner, M. D., S. Morath, K. S. Michelsen, R. R. Schumann, T. Hartung. 2001. Induction of cross-tolerance by lipopolysaccharide and highly purified lipoteichoic acid via different Toll-like receptors independent of paracrine mediators. J. Immunol. 166:5161.-5167. Sato, S., F. Nomura, T. Kawai, O. Takeuchi, P. F. Muhlradt, K. Takeda, S. Akira. 2000. Synergy and cross-tolerance between Toll-like receptor (TLR)2- and TLR4-mediated signaling pathways. J. Immunol. 165:7096.-7101. Hajishengallis, G., M. Martin, R. E. Schifferle, R. J. Genco. 2002. Counteracting interactions between lipopolysaccharide molecules with differential activation of toll-like receptors. Infect. Immun. 70:6658.-6664. Martin, M., J. Katz, S. N. Vogel, S. M. Michalek. 2001. Differential induction of endotoxin tolerance by lipopolysaccharides derived from Porphyromonas gingivalis and Escherichia coli. J. Immunol. 167:5278.-5285. Dobrovolskaia, M. A., A. E. Medvedev, K. E. Thomas, N. Cuesta, V. Toshchakov, T. Ren, M. J. Cody, S. M. Michalek, N. R. Rice, S. N. Vogel. 2003. Induction of in vitro reprogramming by Toll-like receptor (TLR)2 and TLR4 agonists in murine macrophages: effects of TLR “homotolerance” versus “heterotolerance” on NF-κB signaling pathway components. J. Immunol. 170:508.-519. Deiters, U., M. Gumenscheimer, C. Galanos, P. F. Muhlradt. 2003. Toll-like receptor 2- and 6-mediated stimulation by macrophage-activating lipopeptide 2 induces lipopolysaccharide (LPS) cross tolerance in mice, which results in protection from tumor necrosis factor α but in only partial protection from lethal LPS doses. Infect. Immun. 71:4456.-4462. Schuchmann, M., F. Hermann, J. Herkel, R. van der Zee, P. R. Galle, A. W. Lohse. 2004. HSP60 and CpG-DNA-oligonucleotides differentially regulate LPS-tolerance of hepatic Kupffer cells. Immunol. Lett. 93:199.-204. Kilmartin, B., D. J. Reen. 2004. HSP60 induces self-tolerance to repeated HSP60 stimulation and cross-tolerance to other pro-inflammatory stimuli. Eur. J. Immunol. 34:2041.-2051. Bach, J. F.. 2002. The effect of infections on susceptibility to autoimmune and allergic diseases. N. Engl. J. Med. 347:911.-920. Ebert, R. H.. 1965. The Inflammatory Process Academic Press, New York. Cohen, I. R.. 2000. Tending Adam’s Garden: Evolving the Cognitive Immune Self Academic Press, London. Cohen, I. R.. 2000. Discrimination and dialogue in the immune system. Semin. Immunol. 12:215.-219. Schwartz, M., I. R. Cohen. 2000. Autoimmunity can benefit self-maintenance. Immunol. Today 21:265.-268. Quintana, F. J., P. H. Hagedorn, G. Elizur, Y. Merbl, E. Domany, I. R. Cohen. 2004. Functional immunomics: microarray analysis of IgG autoantibody repertoires predicts the future response of mice to induced diabetes. Proc. Natl. Acad. Sci. USA 101:(Suppl. 2):14615.-14621. Ueki, K., K. Tabeta, H. Yoshie, K. Yamazaki. 2002. Self-heat shock protein 60 induces tumour necrosis factor α in monocyte-derived macrophage: possible role in chronic inflammatory periodontal disease. Clin. Exp. Immunol. 127:72.-77. Ohashi, K., V. Burkart, S. Flohe, H. Kolb. 2000. Cutting edge: heat shock protein 60 is a putative endogenous ligand of the Toll-like receptor-4 complex. J. Immunol. 164:558.-561. Bulut, Y., E. Faure, L. Thomas, H. Karahashi, K. S. Michelsen, O. Equils, S. G. Morrison, R. P. Morrison, M. Arditi. 2002. Chlamydial heat shock protein 60 activates macrophages and endothelial cells through Toll-like receptor 4 and MD2 in a MyD88-dependent pathway. J. Immunol. 168:1435.-1440. Basu, S., R. J. Binder, T. Ramalingam, P. K. Srivastava. 2001. CD91 is a common receptor for heat shock proteins gp96, hsp90, hsp70, and calreticulin. Immunity 14:303.-313. Asea, A., M. Rehli, E. Kabingu, J. A. Boch, O. Bare, P. E. Auron, M. A. Stevenson, S. K. Calderwood. 2002. Novel signal transduction pathway utilized by extracellular HSP70: role of Toll-like receptor (TLR)2 and TLR4. J. Biol. Chem. 277:15028.-15034. Delneste, Y., G. Magistrelli, J. Gauchat, J. Haeuw, J. Aubry, K. Nakamura, N. Kawakami-Honda, L. Goetsch, T. Sawamura, J. Bonnefoy, P. Jeannin. 2002. Involvement of LOX-1 in dendritic cell-mediated antigen cross-presentation. Immunity 17:353.-362. Wang, Y., C. G. Kelly, J. T. Karttunen, T. Whittall, P. J. Lehner, L. Duncan, P. MacAry, J. S. Younson, M. Singh, W. Oehlmann, et al 2001. CD40 is a cellular receptor mediating mycobacterial heat shock protein 70 stimulation of CC-chemokines. Immunity 15:971.-983. Lazarevic, V., A. J. Myers, C. A. Scanga, J. L. Flynn. 2003. CD40, but not CD40L, is required for the optimal priming of T cells and control of aerosol M. tuberculosis infection. Immunity 19:823.-835. Becker, T., F. U. Hartl, F. Wieland. 2002. CD40, an extracellular receptor for binding and uptake of Hsp70-peptide complexes. J. Cell Biol. 158:1277.-1285. Asea, A., S. K. Kraeft, E. A. Kurt-Jones, M. A. Stevenson, L. B. Chen, R. W. Finberg, G. C. Koo, S. K. Calderwood. 2000. HSP70 stimulates cytokine production through a CD14-dependent pathway, demonstrating its dual role as a chaperone and cytokine. Nat. Med. 6:435.-442. Kol, A., A. H. Lichtman, R. W. Finberg, P. Libby, E. A. Kurt-Jones. 2000. Cutting edge: heat shock protein (HSP) 60 activates the innate immune response: CD14 is an essential receptor for HSP60 activation of mononuclear cells. J. Immunol. 164:13.-17. Gross, C., D. Hansch, R. Gastpar, G. Multhoff. 2003. Interaction of heat shock protein 70 peptide with NK cells involves the NK receptor CD94. Biol. Chem. 384:267.-279. Berwin, B., J. P. Hart, S. Rice, C. Gass, S. V. Pizzo, S. R. Post, C. V. Nicchitta. 2003. Scavenger receptor-A mediates gp96/GRP94 and calreticulin internalization by antigen-presenting cells. EMBO J. 22:6127.-6136. Vabulas, R. M., S. Braedel, N. Hilf, H. Singh-Jasuja, S. Herter, P. Ahmad-Nejad, C. J. Kirschning, C. Da Costa, H. G. Rammensee, H. Wagner, H. Schild. 2002. The endoplasmic reticulum-resident heat shock protein Gp96 activates dendritic cells via the Toll-like receptor 2/4 pathway. J. Biol. Chem. 277:20847.-20853.